October is finally here and it is one of my favorite months of the year. For all of us in Vegas it is our signal that says the cool down is finally here! In fact, by Halloween night I might be able to wear jeans and a long sleeved shirt with my flipflops. Still too hot for a hoodie but that is Vegas for you! I love October for many reasons. It is the start of the holiday seasons and it begins with my favorite desert; pumpkin roll. My birthday is also this month and while I am getting older life is just getting better. My kids would say the best thing about October has to be Halloween, hands down!. I love the idea of Halloween! We get to dress up, the trunk or treating and I especially love the carnival our Church does every year! The house gets decked out and every one of my kids has dressed up as a pumpkin at one time or another. There was one time when we all went as the Sanchez Pumpkin Patch, needless to say I got voted down the next year. I still have one at home that dresses up and we get to have tons of fun, he will probably want to be batman again this year! 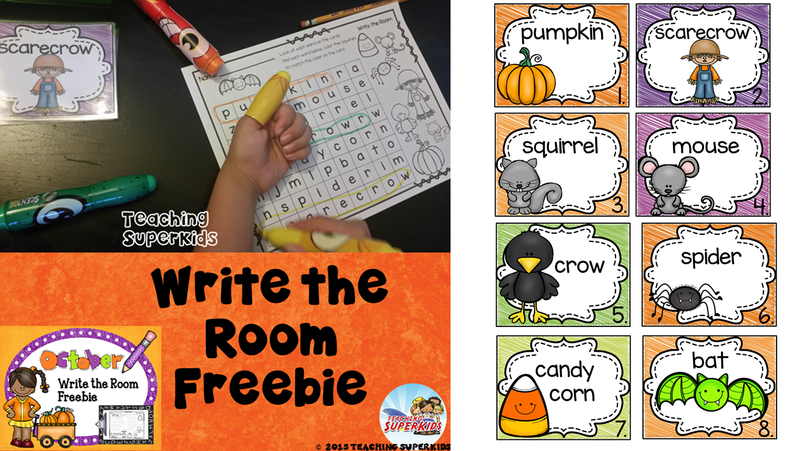 Because I love October so much I created a FOREVER FREEBIE to share with my followers. We were homeschooling at the time that my son was using this set. I found that this works great for those that have limited wall space. You can add the cards to a small container with all the supplies they might need to complete the student response sheets. This set comes with 3 different response sheets! What I love most about these sets is that you can use them over the course of the week and the kids love them! You can use regular markers, crayons or the fun smelly ones! You can get the FREEBIE by clicking HERE or on any of the pictures above! I hope that you and your students will enjoy these as much as mine have in the past! If you would like to see something specific or different please don’t hesitate to let me know in the comments below. If you like this freebie and would like to see more Click on the image below to see the full set for October. I have one for every month and a bundle as well!